With National Volunteer Week upon us, it’s the perfect time to shine a spotlight on our selfless citizens, and one of our longtime volunteers. 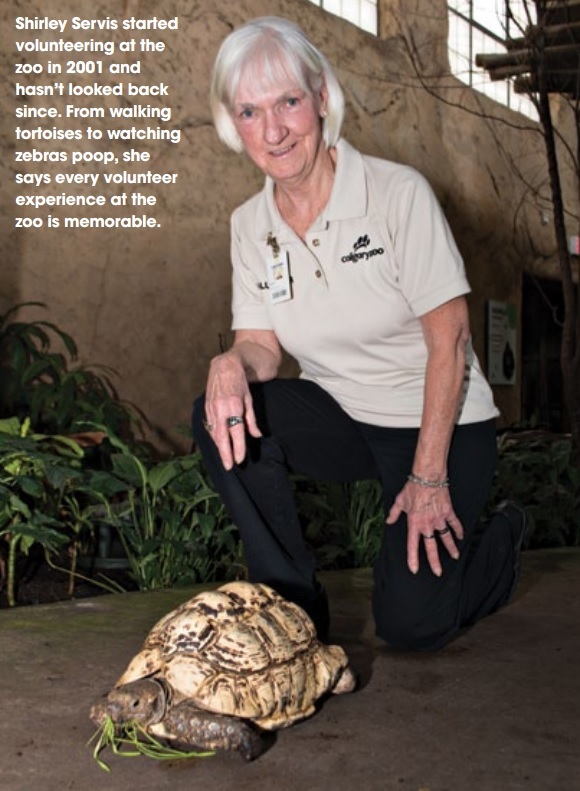 Often seen with our tortoise Sheldon, Shirley Servis is an incredible member of the Calgary Zoo volunteer force. You might think walking a tortoise is a painfully slow way to spend a morning, but Shirley Servis, long-time volunteer with the Calgary Zoo, says that’s simply not so. Every Thursday morning – rain or shine – you will find Shirley inside or outside the TransAlta Rainforest with Sheldon, a leopard tortoise, as her companion. “I like to say that Sheldon is solar powered – he’s a lot more active in the summer than he is in the winter – but he needs his exercise and walking him is a great teaching opportunity,” says Shirley who spends her hour with Sheldon explaining the difference between a turtle and a tortoise, emphasizing the importance of making responsible pet choices and talking about the zoo’s conservation work. Shirley is passionate about animals and people too. It’s the reason she and her husband, Glen, started volunteering at ZOOLIGHTS back in 2001. Shirley is known as Sheldon’s longtime volunteer walker. Now Shirley volunteers two days a week in a variety of roles. On Mondays and Thursdays she starts her day by picking up donated produce from her neighborhood grocery store, delivering it to the zoo’s commissary (animal food preparation facility) and sorting it for animal enrichment. After her food deliveries, she heads over to volunteer in Penguin Plunge on Mondays and on Thursdays she walks Sheldon. Shirley also volunteers at the zoo’s special events and takes every interesting volunteering opportunity she can find. The volunteers at the Calgary Zoo are the backbone of our vibrant and dedicated community. 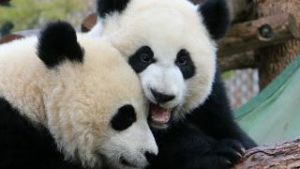 In 2015 alone, over 2000 incredible individuals put their time towards making the zoo one of the top tourist destinations in Alberta, and a leader in Canadian wildlife conservation. Whether old or young, new to the zoo or a volunteer for decades, we are so grateful for their love and support.